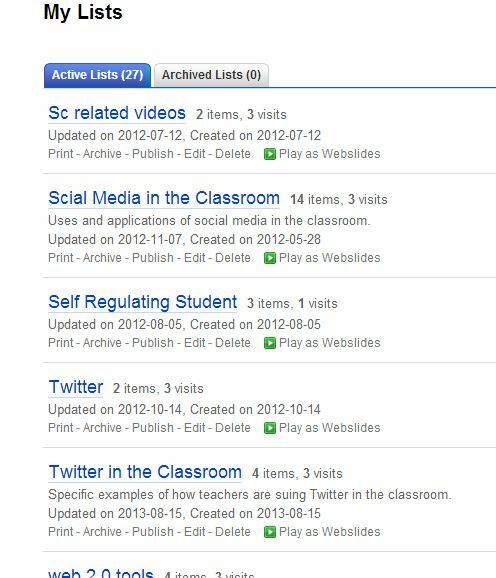 Dreaming of organizing pertinent bookmarks with your students to help them develop filtering and tagging skills? Do you have a ton of great bookmarks but want them a bit more organized? Are you working with a group of teachers interested in a certain topic (for example using twitter in the classroom)? Would you like to share collections of links quickly and easily with your faculty or department? Well maybe it’s time to use Diigo lists! Diigo is a cloud based personal information management system that allows you to save links, highlight (even in different colours! ), create sticky notes, and organize using tags. 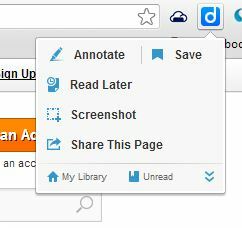 You can share and organize your links using lists and/or groups. All your data is saved “in the cloud” so you can access your info from all devices and locations. Sound good? Check out the summary below. Getting Started: Go to Diigo and open an account. Set up your profile. Go to Diigo tools and drag the digolet to your bookmark bar. It should now show up in upper right hand corner. Hit this digolet button, when you are at a site you want to save the link of. You will see this pop down menu. Press save. You then will be prompted to add a description, tags, add to a list and if applicable share to a group. You can create new lists and groups right from this drop down menu. Be sure to hit refresh after you create a new list or group. Hit save and you are done like dinner! 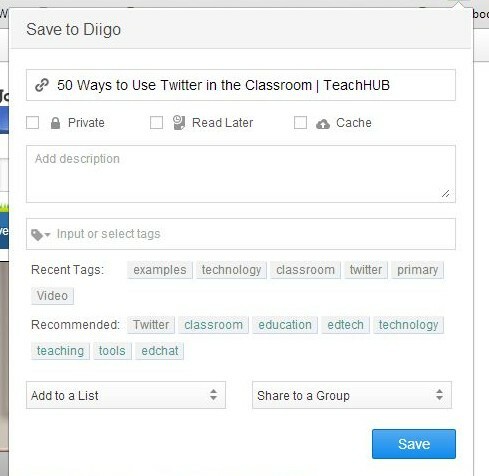 I saved the link above into my Diigo list called Twitter in the Classroom. When I go to the Diigo website (and am logged in), I go into My Library and scroll down, I will see My Lists (this shows all the lists have created in my Diigo lifetime!). 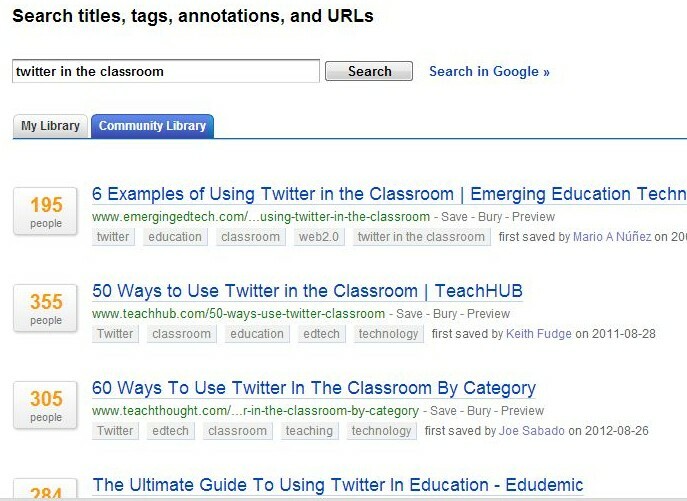 When I click on the list Twitter in the Classroom, the new link 50 Ways to Use Twitter in the Classroom now shows up (with my brief description and tags). I am a fairly lazy Diigo user and I have 27 lists. This took very little effort on my behalf once I had set up my account. I like lists as I can easily and quickly share with others as Diigo provides a Permalink for each of my lists. Hot Tip: Crowdsource what other active Diigo-ers have already bookmarked. 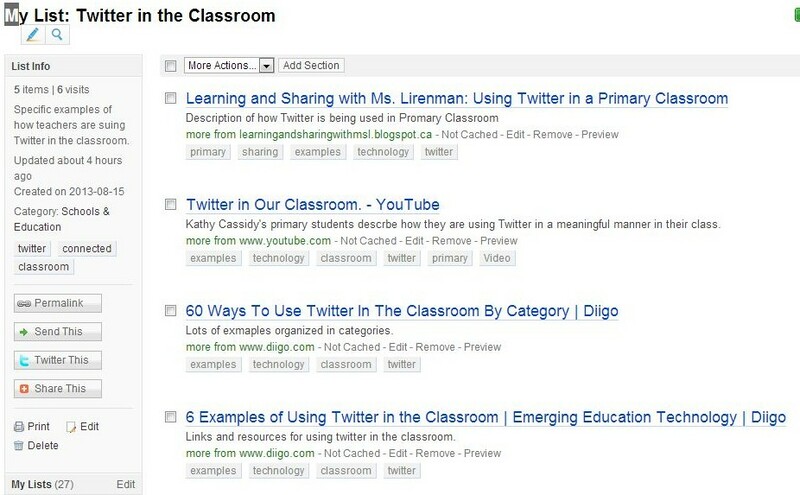 I did a search using “Twitter in the Classroom” and Diigo generates a list of already bookmarked links. To make it even better Diigo shows me the number of peeps who have bookmarked each link. For example, I see 355 people have already bookmarked 50 Ways to Use Twitter in the Classroom, so I might check that link out first. Going further: Consider starting a Diigo group with your classes. Set up relevant tags in advance or with students and make it part of the daily routine to share, tag and bookmark relevant or exciting links students find. At the end of semester students will have a robust library of links and have some highly useful filtering skills. I did this with my Biology classes last year and students said they found it very useful. 3. Dying for more Diigo? Go here! Dreaming of Connection: Woven into we. problems. big and heavy. strewn across my path. i strained to move them. we might pass each other at the copier. you…in your problem bubble and i in mine. “ready to do battle” teacher face. ON. in charge of everything and everyone. it hurt to the bone marrow. do not dream…do not. dreaming is dangerous, it shows on the face: vulnerability. scared to hurt, pieces of broken dreams lying shattered. i sob and sob. heart swollen with buried broken dreams. each of you drift into focus. from dots in the distance to limbed smiling bodies to hug. you and you and you, and…you. people who dream with the lights on. who say things ALOUD that were only said in the secret part of my head. connections pull me up. way up. ahh. 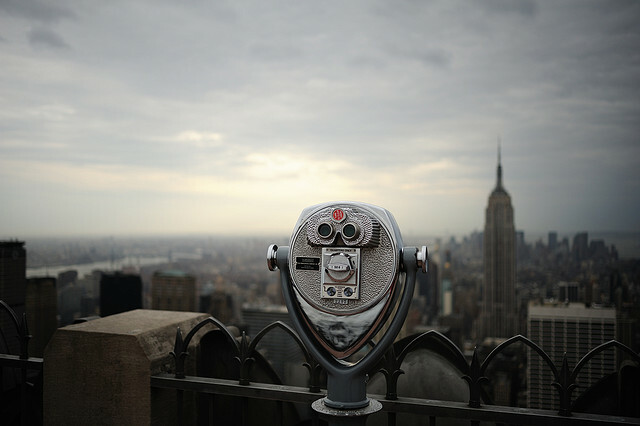 i see far off into the distance. i stretch to explain what i see. no need for yoga. it hurts from growing. brain knitting all the time. dreams. creep. in. like a silent cat. i don’t see them enter. but one day. i wake up and they are here. LOUDLY singing and marching and dancing around. a liquid landscape. always mixing, new reactions, layers of connection. spider-silk strong. invisible and flexible. dream to dream, heart to heart. children of various ages and adult person. we sit in a circle and talk. steaming drinks in hand (we buy a kettle or two in this dream). conversations sculpting our vision into plans. we negotiate the implementation of the curriculum. together in the open. this is not a course. a course it set for you. a course has winners and ribbons and a start gun. no more course. how will this work for you? and how about for you? we decide what the words mean to us in each of our lives. we talk more. esoteric and grounded. it is hard. it is honest. no games. no gaming. no badges. no worksheets. we connect to each. to our own story. we connect beyond the walls cement and cold to warm beings who live in far off places. each of us creating their own unique pattern of connection. each finds their story. the one we have been dying to tell the world. the one we did not know. until we connected to it. we find our way to tell it. building it out of eclectic materials. there are many problems to be solved. children, know them, so much better than me. i will trust them to find and solve the big problems. i bend to support. and then… i see students flex to support me. to support others. strands weave into a shape yet unknown. warp and weft. over and under. over and under. the start of my dream. this will be our dream. i won’t own it this time. a connected classroom. each has to create it. children and adult connected to something greater than themselves. connected to the yin and yang of dreams: impossible and possible. we sink in. deep. into the weave of we. My first EdCamp: Full of light and brightness. I participated in my very first EdCamp at Delta Secondary School in Vancouver B.C. on Saturday. The day was a whirlwind, full to brimming with conversations ideas, and joy. As it was my first, I was uncertain about the outcome; I had heard of EdCamps but wondered if one day of conversation could have REAL impact on me and my practice. I have been to Pro-D days where by 1 PM, I get a “I need a nap” attack and feel drained, checked out and antsy by the end of the day. The day was full of light, brightness and solidified my belief in the transformative power of connection. The bag of rocks I have dragging behind me lately vaporized and vanished. The weight of struggling to change, lightened and lifted. The cloudiness of vision brightened and cleared. The day was a celebration of a culture based on support, community, togetherness, and openness; to honest reflections, differing ideas, new ways, and failures. The day provided me with the gift of time and space to connect and reconnect. Reconnect to what matters, connect to people who have influenced, encouraged and pushed my thinking over the last year and discover new connections to ideas and people. Sometimes it is hard to hear your own voice when you let in too many doubts and begin to question your goals; your dreams and heart begin to hurt, as you wonder is it worth it? At times, I have felt I have been living two contrary, opposing lives; one of hope, vision, bravery and courage and a contrasting one of shame, fear and frustration. The connections and the opportunity to embrace and celebrate these connections that have made a significant difference to my life, my practice, my thoughts as I drive to school, the way I look at the world. The encouragement, be it in the form of a RT from a virtual colleague, the face to face meeting with people I rely on and trust, to a student who came up to strike up a conversation with me, all spotlighted what really matters. The support and encouragement I have felt in and from this community is a gift; I feel so rich and enriched with real examples I see of kindness, community supported growth, risk taking and innovation all nourished and tended to with passion and intent. After the long day I return home, still feeling uplifted and when I wake in the middle of night, with a thought so clear and loud, I get up to Tweet it (and because this world is amazing someone tweets back!). 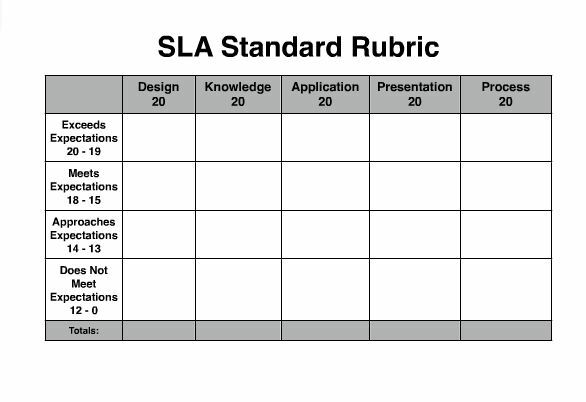 I have been focusing on the things that I cannot change (report card formats, curriculum, department assessment practices etc), structures that are too big for me to push out-of-the-way by myself and right now (sometimes I get impatient). Change isn’t about what I can’t say, it is about what I can say. Change is not about what I can’t impact and control, it is about impacting with intention what I can. It is not about the negative comment from one, but the support I feel from many. I need to focus, move, extend towards (like a plant reaching for light) what I can change, what I can impact and where I can experience growth… I can encourage, support and advocate for other teachers to get connected. I can do that. I can continue to grow and draw on my connections, to my own voice and dreams, to the people who support and care for me. A day that was full of light and brightness. P.S. A loud shout out to Aaron Akune for our conversation at lunch that helped to push my thinking forward and provide words for how I have been feeling. Make like a lichen: Get symbiotic and be a pioneer. Are you trying to grow on a rock all by yourself? Can you grow on rock? Do you struggle to accumulate enough nutrients to sustain to yourself year to year? Is your skill set suited to survival in certain conditions and you fear going extinct if the environment changes? Do you long to colonize new and unchartered territory but just can’t seem to get a foot hold? I used to believe….I could do it all alone. Change the world and ALL that. Inevitably though I would hit a bump in the road or run out of energy, survival mode would kick in and I would lose traction. I had the very best of intentions to embrace change and no doubt I have evolved as a teacher over the years. However I was frustrated but the minimal growth I would experience. “Baby steps” was one of my favorite expressions. My intentions were good, however the longevity and impact of my efforts were at best, superficial. A lichen is a lowly, little, unloved organism that is expert at survival in harsh environments. The lichen looks like one organism, but actually is 2 species (a fungus and an alga) who coexist to the benefit of both. The fungal partner protects the alga who is photosynthetic, producing sugars to feed both. Together they can survive in habitats no other organism can: they grow on rocks, in the extreme arctic, and even on toxic slag heaps. Their ability to extend their skill set gives them advantage in colonizing areas that no other organism can. Growing on a rock is no problem! Moreover these deceptively simple life forms modify the environment they inhabit and produce conditions under which other organisms can then live. They act as pioneers for others. I hear you saying: “Heck, I am not here for a Biology lesson Ms. Durley!”, but hold up a sec. What if to experience transformative growth we need to intertwine our learning in a symbiosis of sorts? What if we must allow ourselves to be vulnerable, dependent, and open, just like the fungus on the first day, admitting that there was no possible way that he could photosynthesize, but he was sure good at offering protection for survival in harsh conditions? In the olden days, I equated needing someone else to get my job done as, not getting my job done. Over the years in my efforts to be strong I also became brittle. I had mistakenly categorized compromise as weakness. In my perfectionist mind-set, I believed that if I did not have total control, then the project, lesson-plan or venture would not “work out”. But what if… in order to experience true and lasting change we need to go colonize some “barren rock” and to do that we need deep, meaningful collaboration with others. What if the collaboration has to go beyond….sharing, brainstorming, supporting and listening to each other. What if the relationship has to venture into the symbiotic, and we have to show up ready to be vulnerable like the fungus did on that very first day. Are you ready to colonize that barren rock, can you do it alone, are you willing to get symbiotic? Heads up, growing on rock is hard work, but sand is fine, fine, fine. My secret teacher super power: Collaboration. Luckily for me when I heard about the flipped class last spring, I told another 2 teachers who shared in my enthusiasm for the idea. Also luckily our principal Scott Mclean (@OKMScott) was able to send the three of us to the Flipped Conference in Woodland Park, to see the pioneers of flipping, Aron Sams (@chemicalsams) and Jon Bergman (@jonbergmann). The conference and trip, forged the foundation for what developed into a flourishing collaborative team that has single-handedly supported me through my first bumpy year of the flipped class. Yes I have heard of collaboration and of course I have worked with many teachers over the years. We have had days designated as “collaborative”, we have collaborated as a department, and we have collaborated across departments. However, I had never really collaborated before. I can’t articulate exactly why this collaboration is unique or successful. I think it is due to the large risk we all took in embarking on the flipped class. I just know that could not have made it this far on this journey without my fellow flippers. When I run out of energy and enthusiasm, our debrief and strategy sessions re-charge my batteries. When I have the proverbial worst day and get the itch to go back to my Powerpoint haze, I talk it though. This does take time and energy and it also takes bravery to show your practice to other teachers, blemishes and all. However the strength it has imparted to me to stretch myself as a teacher it most certainly a worthwhile trade-off. I am more humble and open about my practice; and I feel ready to open my doors (although it still is intimidating for me). 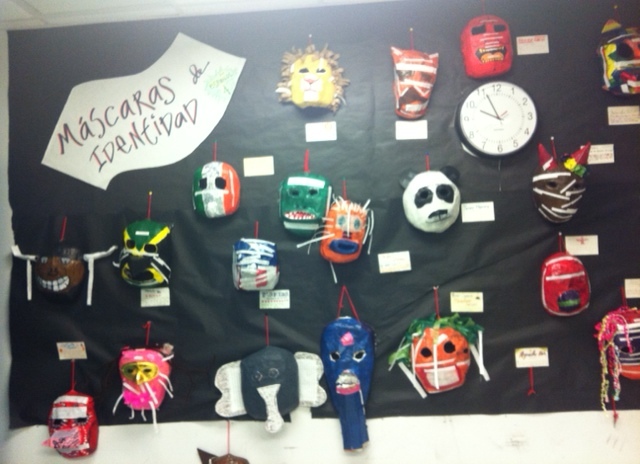 I like what the flipped class has done for my students;regardless of the criticism out there right now. The flipped class has put the learning firmly back in the hands of the learner, it has provided me a fresh perspective, it has got me out-of-the-way, it has me looking for and trying new ways to work with students. This process is messy as I find my way and there is always the risk of failure. However; I know someone has my back, I feel ready to take some big risks and to work through the bumps in the road. I am proud to work with my fellow risk takers and I a feel ready for the big challenges ahead!